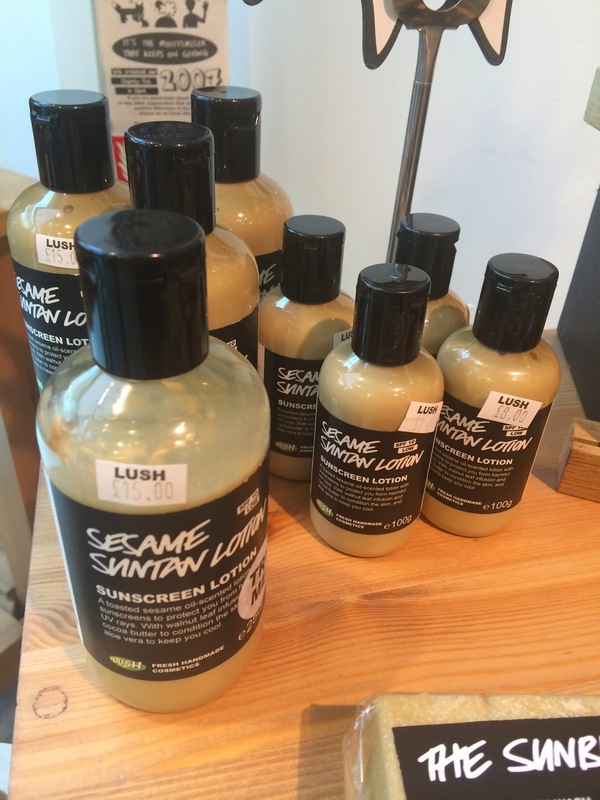 If you're a regular reader of my blog you probably know I work at Lush, amongst my many jobs, today we received a much anticipated delivery at Lush Stirling, after months of excitement Lush Sun Care is now available online and in stores. The new range of Lush Sun Care products are designed to go 'above and beyond' like all Lush skincare the products are packed with the highest quality natural ingredients ensuring that your skin is not only protected from the sun but is left feeling silky smooth and looking fabulous! The range is made up of a two lotions, a moisturiser and very excitingly a solid sunscreen wash, I'm going to do a mini review of my favourite product so far which is Million Dollar Moisturiser but firstly shall explain all 4 of the products. 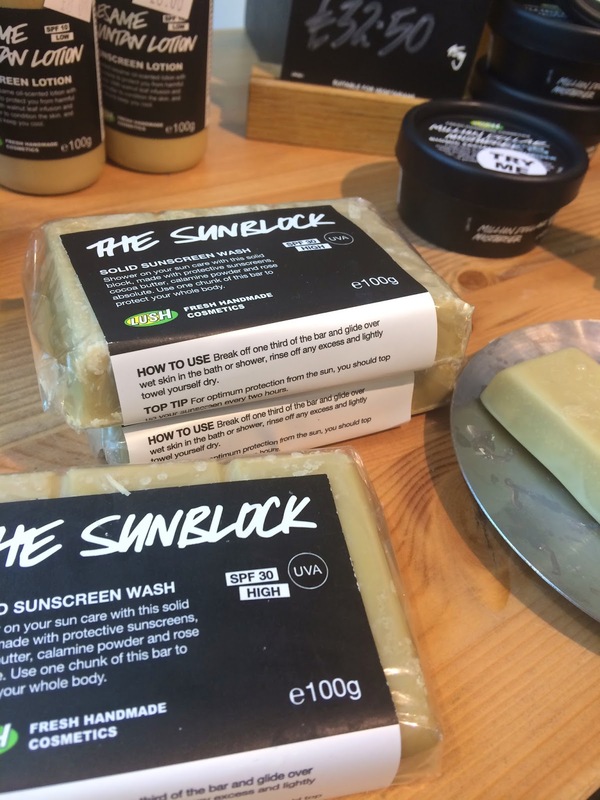 First up 'The Sunblock' (SPF30); all of the Lush sun care products have been developed using industry standard synthetic sunscreens, which provide not only sun protection but also protection from UVA rays. 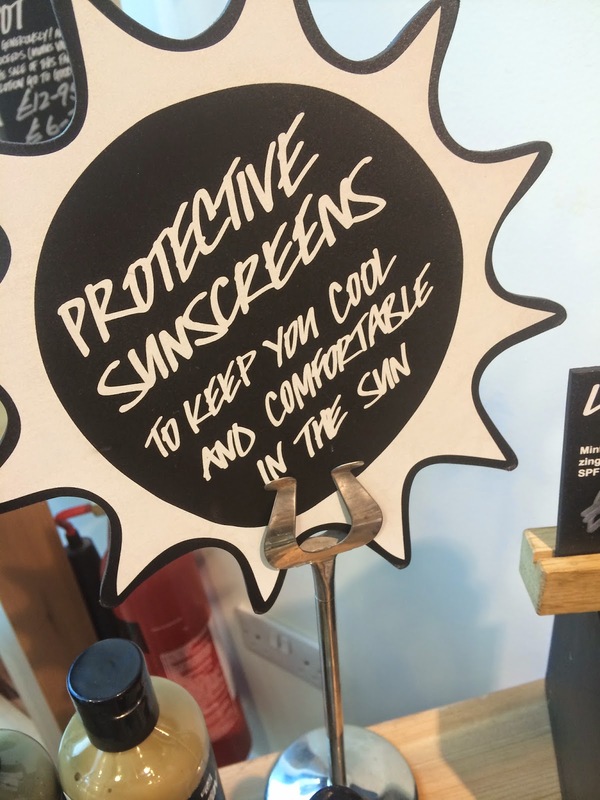 The Sunblock is a truly unique and innovative product which takes the hassle out of protecting your skin from the sun, by simply washing on the bar during your morning shower. The solid sunscreen bar is very similar to Lush body butters and not only protects but also softens your skin, perfect huh?! 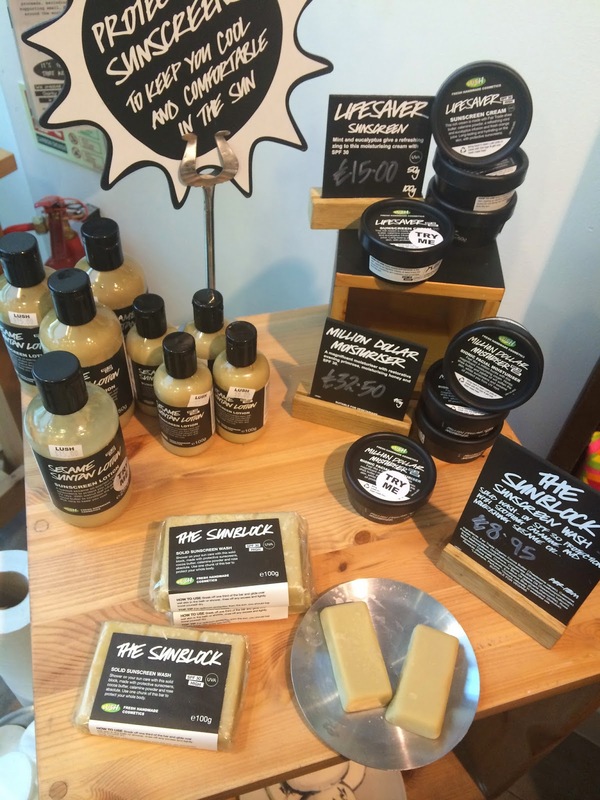 Made with cocoa butter from the Fundopo Peace Collective in Colombia as well as Calamine powder to soothe, and sesame oil to increase the effectiveness of the synthetic sunscreens. Next up is 'Sesame Suntan Lotion' (SPF10) the perfect sunscreen for those of us who are wanting to achieve a lovely golden tan yet still protect their skin. Again featuring sesame oil and Fairtrade organic Colombian cocoa butter, this lotion sinks into the skin quickly and also works as a pretty nifty after sun, thanks to Aloe Vera extract which will soothe and cool skin after a day spent in the sunshine. 'Lifesaver' (SPF30) is a refreshing and nourishing sun cream with lovely cooling ingredients such as mint, eucalyptus and avocado oil, it's sure to protect the skin from the sun and leave it in tip top condition. 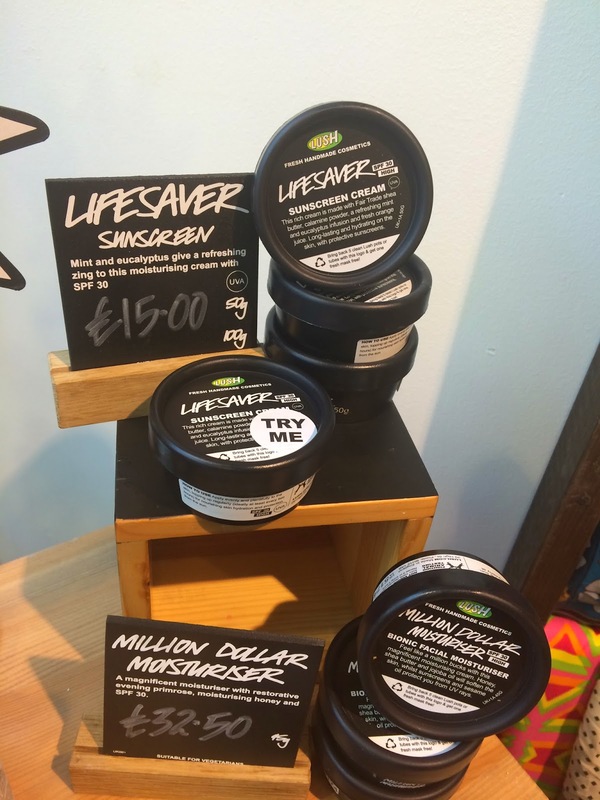 Not one to be forgotten Lifesaver is made up of lovely nourishing murumuru and cocoa butters, as well as calamine powder which naturally protects the skin from UV rays. 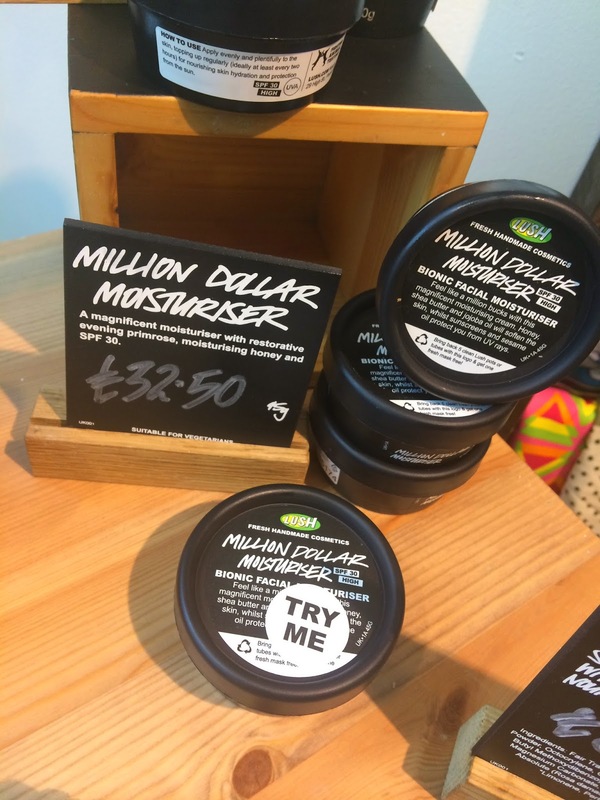 Saved the best for last for y'all... 'Million Dollar Moisturiser' is the newest addition to the famous Lush Skincare range, offering up high quality ingredients, SPF 30 protection and a subtle shimmer perfect for adding a delicate glow during the summer months. I'm definitely a big fan of Million Dollar Moisturiser, personally I find for my skin which is combination/sensitive that British Nanny is a tad too heavy for me, but MDM is just the ticket. The formulation is a light yet nourishing, with a delicate happy fragrance. I find that it leaves my skin feeling moisturised and leaves my skin with a touch of a healthy glow, it'll definitely be a must on my summer holiday to Florida next month! During the summer I don't like to wear heavy foundations and instead favour a facial sunscreen and concealer combo, I'm super cautious of protecting my skin, especially on my face (don't want any wrinkles now eh!!) and I love not only how MDM makes my skin feel, soft and moisturised, but the fact that I'm protecting it from the sun at the same time, perfect!